Size: 3.5cm * 0.5cm hair clip in the backside. Hand-made; This value pack is suitable for all sized dogs from small to large with long hair. A must have for pet parents who are in the market searching for hair accessories. Spot clean; Made of high quality satin and grosgrain ribbon with durable clips. Perfect for keeping long hair out of your dog’s eyes. 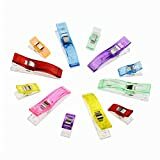 Perfect for pampered pooches and felines, these hair clips are a great way to keep long hair out of their eyes. There are 4 items in this value pack: 2 satin bow clips and 2 flower clips. If you look closer to those hair clips, you will definitely find the detailed design aspects from Blueberry Pet. That’s what made our products stand out and labeled as designer pet brand. 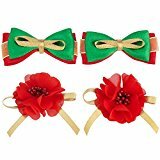 While the bow clips feature the festival colors: classic green, red and touches of gold; thered flower hair clips have their owner features too. The flower hair clips feature bold red color with gold ribbon for added style. Your loved furry friends would look even cuter and lovely with those hair clips!